This is a 1-amp variable-voltage PSU. It adjusts from about 3v to 24v: and has the added feature that you can limit the maximum output current. This is invaluable when (for example) you power-up a project for the first time or soak-test a piece of equipment. SW3 is the on/off switch. It also lets you choose between the output with the current limit and the one without. SW2 provides a selection of three different limits. You can increase or decrease this number if you wish. The limits are fixed by R4, R5 & R6. They are set at 10mA, 25mA & 65mA respectively; but you can choose whatever limits you like. 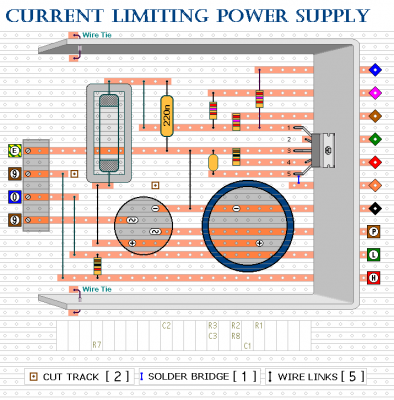 If you try to draw a current above the limit you've selected, the output voltage will fall. Thus, the voltmeter indicates when the load on the output is excessive. The housing should be well ventilated. The heatsink is a folded strip of aluminium about 2mm thick, 18cm long and 6cm tall. 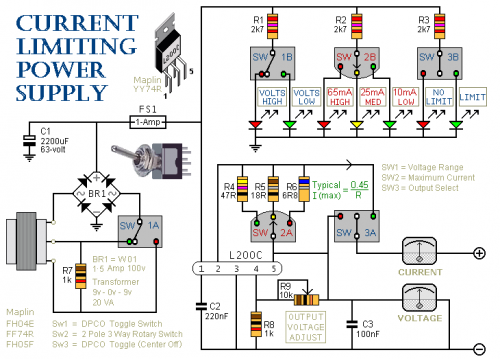 SW1 allows you to choose between the (3v to 12v) and (3v to 24v) outputs. This reduces the power the heatsink has to dissipate when the output voltage is low. 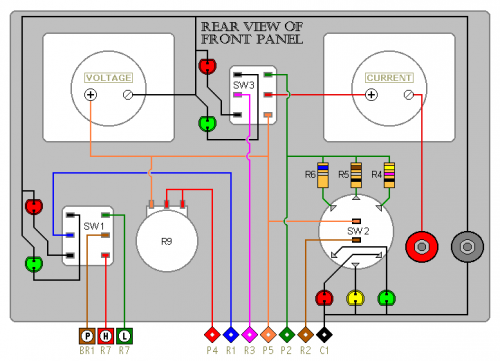 The drawing of the front panel is intended mainly as a wiring diagram - you can choose your own layout. The pin spacing of the L200C doesn't suit the stripboard; but with a little persuasion it can be made to fit. Since the limiting resistors may have a relatively low value, a few ohms between the contacts of the wafer-switch will have a significant effect. If (with time) you find that the limits have fallen, use a spray-cleaner on the switch.